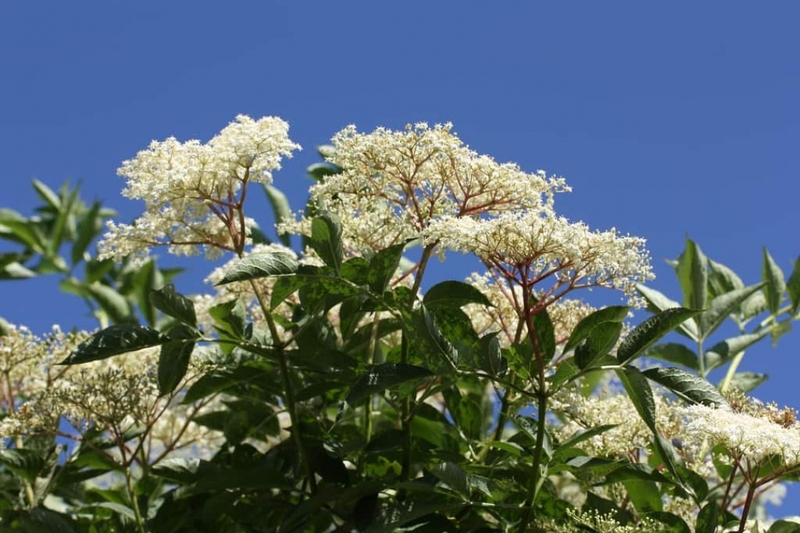 Elderflower (Sambucus nigra): growing, planting, caring. A large vigorous shrub very common, especially in France, blooming in the summer in large white umbels, and later clusters of edible fruits in abundance. Sambucus nigra is a species of flowering plants in the family Adoxaceae native to most of Europe and North America - common names include elder, elderberry, black elder, European elder, European elderberry and European black elderberry. It grows easily in the wild, in a variety of conditions including both wet and dry fertile soils but sunny locations. It is a deciduous shrub or small tree growing to 6 m (20 ft) tall and wide. The leaves are arranged in opposite pairs, pinnate with five to seven leaflets with a serrated margin. The hermaphrodite flowers have 5 stamens and are borne in large, flat corymbs in late spring to mid summer. The individual flowers are white with five petals. The fruit are black berries in drooping clusters in late autumn - and are an important food for many fruit-eating birds. Plant elderflowers from late fall to early spring, in the sun or partial shade in moderately rich, cool, drained soil. Dig a hole twice as large as the root ball, without mixing the layers of soil that you will replace in order after planting. Plant without burying the base of the stems, tamp the soil well around the roots, then form a hollow and water until the water no longer flows visibly. If you are planting in the winter, prune all the branches to ground level, to promote vigorous regrowth. Elderberries are rather resistant to drought. So no need to water, except for horticultural elder species. The first month after planting, pour a watering can once a week at the base of your elderberry if it does not rain a lot. You do not have to prune elderberries! If they look too entangled, in March remove some of the main branches in the heart of the shrub, those that come back in and all the dead wood. - If they are not vigorous: in March each year, prune all branches, just flush with the ground; this operation is called coppicing, it forces the plant to re-emit stems from its roots. If you notice that your shrub is weakened by competition from taller plants, trim it every other year.